Ireland secured a place in the women's Champions Challenge final thanks to a 2-1 win over South Africa in Glasgow. 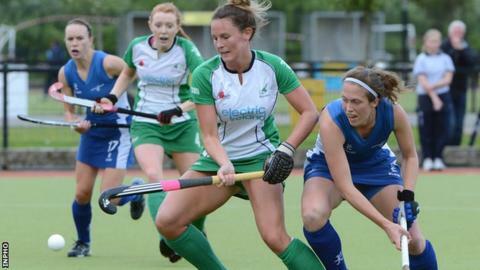 Celia Evans put South Africa ahead in Saturday's semi-final but Ireland hit back with goals from Megan Fraser and Nicola Evans. Ireland will play Spain or the United States in Sunday's decider. However, Ireland men's team lost 2-1 to Korea in their Champions Challenge semi-final in Malaysia and will face the hosts in the bronze medal match. Jang Jong Hyun and Huyn Sung netted to give Korea a 2-0 lead before Chris Cargo scored for the the Irish. The Irish women held on to win after keeper Emma saved a penalty stroke from Tarryn Bright on 59 minutes. Ireland coach Darren Smith said: "I thought we did really well, defensively we were pretty sound and for patches of the game we played extremely well. "This is a group of young girls that work so hard who want to play good international hockey and to be in the final is fantastic."